The doctrine of public interest inununity that allows sensitive material to be withheld qualifies a defendant's usual right to knowledge of all relevant material in a criminal case. Ex parte claims of public interest inununity in the absence (whether in person or through the use of redacted submissions) of the defendant and/or his or her lawyer have become a regular feature of modem legal practice. However, ex parte public interest immunity claims are inherently problematic. This article examines the questions of who should make such claims so that the procedure is least likely to be abused. It discusses the problem of ex parte public interest inununity claim determinations, especially in the context of terrorism and organised crime cases. It explains how a 'special advocate' may be used to safeguard the interests of an affected absent party. This article outlines the use of special advocates abroad and in Australia to date. It then critically analyses the usefulness of special advocates. It concludes by proposing a novel solution for ex parte public interest immunity claims. 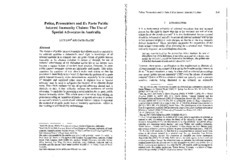 This article asserts that rather than relying on prosecutors acting as 'ministers of justice' or special advocates to protect an accused's interests, courts should entrust defence lawyers to represent the accused at ex parte public interest immunity applications, subject to their making of confidentiality undertakings.